Scottish winter landscape scene, showing a large cart laden with felled timber. Birnam Hill is in the background. 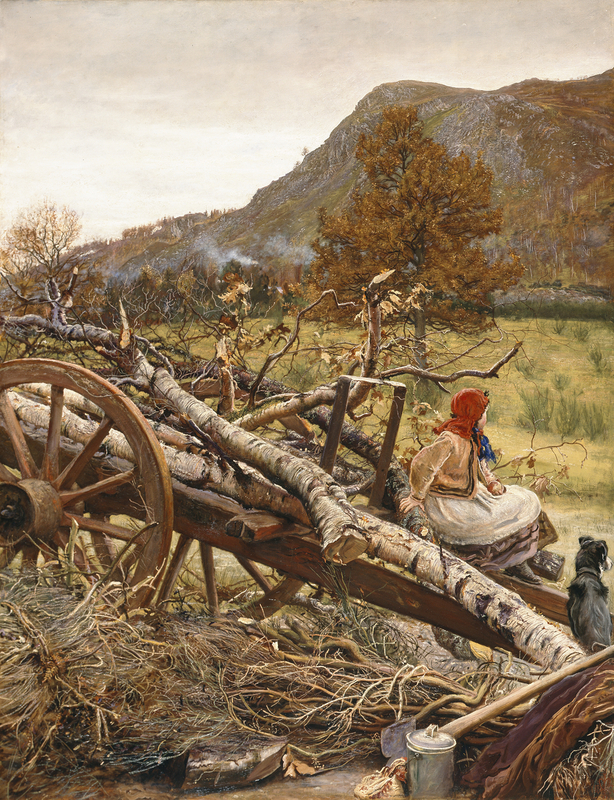 The cart occupies the foreground, its wheels at the left of the composition and its shafts resting on the ground to the right; on it are the branches of silver birch and oak, with brush-wood piled on the ground around the wheels. A young girl is seated in profile to the right on the far shaft. She wears a red headscarf tied under the chin and a short jacket over an apron and dress; her head is turned away from the viewer, her left hand resting in her lap and holding an apple, her right hand placed on a branch behind her. Between the shafts is a collie, also looking into the distance. The surrounding landscape appears to be marshy farmland at the foot of the dramatic, rocky hillside in the background, which slopes downward from the upper right corner; along its lower slopes are wisps of smoke. A young oak tree with curled brown leaves stands in the middle ground, below the profile of the hillside. Winter Fuel 1873 John Everett Millais 1829-1896 Oil on canvas This is one of a number of large Scottish landscapes Millais painted periodically during his later career. The view here is of Birnam Hill in Perthshire, near where Millais was living at the time. Winter Fuel is wonderfully atmospheric, evoking a mood of melancholy contemplation. When first exhibited at the Royal Academy, London, it was accompanied by a line from Shakespeare's Sonnet 73, 'Bare ruined choirs, where once the sweet birds sang'. The sonnet reinforces the idea of autumn as a metaphor for the painter's own passing years. Contemporary critics praised the painting for its workmanship and for lifting realism into a new realm by the masterly use of colour.